AGANA, Guam (CNS) — U.S. Cardinal Raymond L. Burke, accompanied by an official from the Congregation for the Doctrine of the Faith and three canon lawyers, spent two days in Guam interviewing witnesses and alleged victims in a clerical sexual abuse case against Archbishop Anthony S. Apuron of Agana. The Archdiocese of Agana, in a Feb. 18 statement, said the cardinal and officials had left the island that morning after hearing testimony Feb. 16-17 “as part of the canonical penal trial” involving accusations against the archbishop. “They conveyed their appreciation to all individuals whom they interviewed during their work here and encouraged all of Guam’s faithful to remain grounded in Christ,” the archdiocese said. During a news conference Feb. 10, Archbishop Byrnes had announced that the archdiocese voluntarily adopted the U.S. Conference of Catholic Bishops’ Charter for the Protection of Children and Young People. The charter calls for mandatory training of all adults entrusted with the care of children as well as mandatory audits. The church can never judge itself. Judgement must be by civil law enforcement to give fairness to victims. Burk would find the priest blameless if the act occurred in the middle of mass on Sunday morning. Interviewing witnesses ? Four members of the Clergy in full Priestly garb in a room with the victim who is not allowed to have a lawyer or support person ? Have you ever heard of a ‘Star Chamber’? Some victims refused to submit themselves to the humiliation of a fake interview. 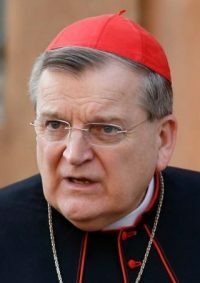 card Burke has a reputation for protecting his fellow priests. I am praying for Archbishop Apuron and that the truth may be revealed.